Born in Washington, DC, a native of Dallastown, PA, and a 2001 graduate of Dallastown Area High School, Sergeantt Christopher Wrinkle enlisted in the Marine Corps in 2003. Prior to joining the Marine Corps, Sgt. Wrinkle was a wrestler and active member in his church. He began his career as a rifleman with 3rd Battalion, 2nd Marine Regiment, Camp Lejeune, NC and joined MARSOC in 2007. In 2009, Sgt. Wrinkle was assigned to MARSOC’s Marine Special Operations Support Group as a Multi-Purpose Canine handler. Sgt. Wrinkle deployed in support of Operation Iraqi Freedom and Operation Enduring Freedom. On his last deployment to Afghanistan with Golf Company, 2nd MSOB, Camp Lejeune, Sgt. Wrinkle had recently returned from a lengthy nighttime patrol when the barracks where he was sleeping caught fire. Sgt. 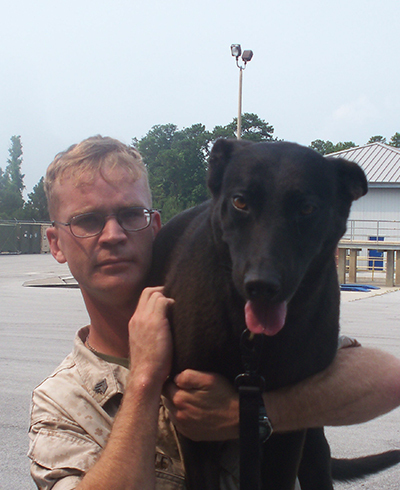 Wrinkle, his dog Tosca, and two fellow Marines were killed in the fire, and two others were injured. Sgt. Wrinkle’s personal decorations include a Purple Heart, Combat Action Ribbon, and two Good Conduct Medals.